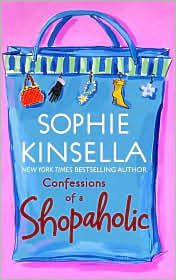 I got Confessions of a Shopaholic, by Sophie Kinsella yesterday. I started reading it last night on the treadmill. It's really good so far, except that now I feel like I need to watch my money because this girl is in debt. I just got paid today and I feel like I am trying to make it stretch until next week. I'll let you know if it ends well.